Coming up Frank Holmes, CEO of U.S. Global Investors joins me to share his thoughts on Trump’s first 100 days, the resetting that’s going on the global political front and gives what he sees as a very realistic price target for gold before the end of the year. 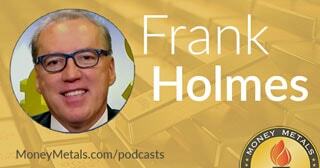 Be sure to stick around for a fantastic interview with Frank Holmes, coming up after this week’s market update. Precious metals markets are putting in a mixed performance this week as gold prices hold above their breakout level from the prior week. Spot gold currently comes in at $1,287 an ounce, essentially unchanged on the week. Silver, meanwhile, is faring worse on the charts. Last week’s apparent breakout to slight new highs for the year in silver didn’t bring any follow through this week. Silver prices are down 3.3% since last Friday’s close to trade at $17.97 an ounce, meaning the gold to silver ratio has widened this week to 71.6 to 1. Turning to the platinum group metals, both platinum and palladium rallied strongly on Thursday to erase losses posted earlier this week and are both now little changed since last Friday’s close. Platinum currently trades at $981 per ounce, posting a small 0.3% gain on the week. Palladium comes in at $797 and is registering a weekly loss of 0.4% as of this Friday morning recording. Well, millions of Americans breathed a sigh of relief after tax day came and went. Their filing obligations may be over until next year, but there is no reprieve from accumulating tax liabilities at the federal, state, and local level. According to the Tax Foundation, Americans will pay more than $5.1 trillion in taxes at all levels this year. That doesn’t even include compliance costs. But actual taxes paid still amount to more than we will spend on food, clothing, and housing combined. Another way of calculating the tax burden governments impose on us is by looking at how many days in a 365 day year we have to work on average just to pay taxes. For 2017, Americans have to work from January 1st until April 23rd – 113 days – to reach Tax Freedom Day. If the future liabilities represented by current federal borrowing were included, then Tax Freedom Day wouldn’t come until May 7th this year. The Trump administration wants to cut tax rates but has no realistic plans to cut the deficits. In fact, Trump’s Treasury Secretary Steven Mnuchin is demanding that Congress raise the debt ceiling even as he champions tax reforms. Interviewer: A lot of money coming in? Steven Mnuchin: …tens and tens of billions of dollars on tax day. We will get tax reform done. It'll be sweeping. It'll be significant, and it will create a lot of economic growth. Stock market investors will take growth any way they can get it. They still seem willing to give the administration and Congress the benefit of the doubt on getting something done this year on Obamacare and tax cuts. But if nothing happens by this summer, the big hope now priced into stocks could turn into big disappointment. Even if Donald Trump does get his tax reforms through Congress, that won’t necessarily be a positive for the U.S. dollar. Deficit hawks fear the return of trillion dollar deficits and new quantitative easing programs to paper over the growing shortfalls. Prudent investors are diversifying into physical precious metals and increasing their holdings as opportunities present. Buyers of all budgets will find a wide selection of bullion products at Money Metals Exchange. We are always looking to expand our inventories with new and interesting coins, rounds, bars, and the occasional item that is in a unique category of its own. Gold jewelry normally wouldn’t be something we would sell because it doesn’t have the purity of bullion and carries hefty mark ups over most retail bullion products. However, we are pleased to announce that we now do offer a one-ounce pure gold bracelet. This form of “wearable bullion” is crafted from 1 troy ounce of .9999 fine (or 24 karat) gold, with a beautiful hammered finish. The bracelets are manufactured with care here in the U.S. and stamped with its .9999 purity on the inside ring. They are shipped in a gift style box with a certificate of authenticity. The classic and simple design is suitable for either a man or a woman. Give one of these bracelets as a gift, put one on your own wrist or simply add them to your gold bullion holding. You can obtain these beautiful and stunning gold bracelets from Money Metals without the jewelry mark-ups! Premiums range between just 7% and 9% over the melt value, meaning these bracelets are competitive with the premiums found on most one-ounce gold bullion coins, such as the American Eagle. Since they look just like ordinary jewelry, these bracelets are also a convenient vehicle for transporting significant amounts of wealth when traveling. A small amount of jewelry won’t raise too many questions from suspicious TSA or Customs agents who would more heavily scrutinize gold that is transported in the form of coins. To order gold bracelets or other product offerings from Money Metals, give us call us at 1-800-800-1865 or visit our website at MoneyMetals.com. Mike Gleason: We are fortunate today to be joined again by Frank Holmes, CEO and Chief Investment Officer at US Global Investors. Mr. Holmes has received various honors in recent months including being named America's Best Fund Manager for 2016 by The Mining Journal and received two more Lipper awards just last month in both the three year and five year precious metals equity funds categories. He's also the co-author of the book The Goldwatcher: Demystifying Gold Investing and is a regular guest on CNBC, Bloomberg, Fox Business, as well as right here on the Money Metals podcast. Frank, welcome back and thanks for joining us again. How are you today? Frank Holmes: I'm well, thank you. Mike Gleason: You mentioned back in January when we had you on right before Donald Trump's inauguration that the first 100 days of his presidency would be a key on several fronts. Give us your thoughts on what these first 100 days have looked like. What have you gleaned from the last few months as you've been evaluating his policy decisions and the market's reaction to those? Frank Holmes: Well, I think it's really difficult to grasp the difficulties of getting change in Washington. There's just so many people that are addicted, from lobbyists to whatever on regulations and more rules and regulations. Regulations for taxation for every agency there is. It's been much more difficult for him to tackle that than it was expected, and that's recently showing up with interest rates falling back below and giving a negative interest rates, gold rallying from that. I think it's hard for the average investor because something like 70% of the media is biased, and they're pro-Democrat no matter what it is, and so you find the narrative from even so many business columns are wanting Trump to fail. I find that really saddening because a great investor, the greatest in the world, Warren Buffett, who bet on Hillary Clinton and then when Trump won he said, "Well, I'm behind the President and if he does well we all do well, so that's what I'm going to do," and I'm more of a Buffett cheerleader in a thought process, so I think it confuses a lot of people that how difficult it is, and I think that to really read through his message, that he wants bilateral agreements, he wants to renegotiate agreements with the benefit to the middle class of America. I think that that's very positive, but no matter what he does, we're just getting skewed with a negative sentiment. Government's basically have two levers to manage the economy. One is monetary policy, the other is fiscal policy. Monetary policy is money supply and real interest rates. Fiscal policy is tax and spend and regulations are an indirect taxation on a sector of the economy. When it comes back, what we witnessed under Obama was an administration that was on steroids in every department on new regulations. It was a massive increase, and the only way to have economic growth with this massive increase in regulations which has always been a drag on the economy, is to have cheap money. Low interest rates, and to a point where they went negative. When I say negative, is that every month we get what's called the "CPI number." The CPI tells us what Consumer Producer Index of inflation is. That inflation index is an important factor because if it's 2% and the government wants you to buy their 10-year government bonds, and they're only going to pay you 1.5%, you'll say, "Well, that's a bad deal. I'm going to lose half a percent every year for 10 years." Whenever that happens, gold becomes a very attractive asset class, and so do companies that are paying dividends and have the capacity to raise dividends. That's the other part where you see in the stock market rally for the past eight years predominately, and we've had negative interest rates. And you see gold fall and rise every time we've had this positive/negative. For your listeners, every month the CPI number comes out, and you deduct that from whatever the government wants you to pay for their 5-year and 10-year government money, and the core relation is immense. Anytime they're paying you more than the CPI number, gold falls. Anytime they're paying you less, gold rises. Mike Gleason: Yeah, very well put. It is obviously a big thing that we look at, and we'll need to continue to look at. What are you expecting for that situation here going forward? Do you expect a negative real interest rate environment to persist here, Frank? Frank Holmes: Yeah, I think that as long as you have this massive burden of regulations, you're going to have to have cheap money. Raising interest rates right now is only going to hurt the economy, and there's some parts that are already trying to show up with that. The concerns, stay away from auto parts. Automakers have a huge inventory, and a lot of the recent cars have been financed with basically junk paper, because a lot of people can't qualify. It seems to be a very risky sector. So, what happens if that short term interest rates now, I remember I wouldn't call and ask some car dealers locally, and if you want to use their services, it's 4% for a car. If you can get one of the credit unions here, you can get it down to 2%, but a year ago it was one and a quarter. Mike Gleason: Yeah, I think that as long as you have this massive burden of regulations, you're going to have to have cheap money. Raising interest rates right now is only going to hurt the economy, and there's some parts that are already trying to show up with that. The concerns, stay away from auto parts. Automakers have a huge inventory, and a lot of the recent cars have been financed with basically junk paper, because a lot of people can't qualify. It seems to be a very risky sector. So, what happens if that short term interest rates now, I remember I wouldn't call and ask some car dealers locally, and if you want to use their services, it's 4% for a car. If you can get one of the credit unions here, you can get it down to 2%, but a year ago it was one and a quarter. Frank Holmes: I was in London also and I had a lovely lunch with Nicholas Vardy. Very insightful. He's a newsletter writer that went to Stanford and then did his law degree at Harvard, and was there when President Obama was there, and our new Supreme Court judge. So, he's very insightful and talkative, and gave me lots of color, and whenever I travel to these places, I always ask the taxicab drivers what do they think, and the thoughts of Brexit, it was ubiquitous. Everyone was happy for Brexit to go through, and they felt that the unions have taken control of the government policies in Spain and Italy and France, have prevented young people from getting jobs, and the only place for opportunity is in the UK. They can handle only 50,000 families a year and there's 500,000 coming in a year. So, they feel that you can't stop these socialist unelected officials, and they'd rather control their own destiny. So, I think the Brexit is an interesting event, and I think that probably the vote will still remain very strong, even though most of the media don't want to see it happen, but I think it will. I saw when I was in Zurich the construction was booming, there's lots of reservations on the regulatory world globally. They believe that globalization, the slow down of that took place 10 years ago with the difficulty of moving money, the proof of burden that your money is your money, and the paperwork that goes with it, that they will not open an account for any American taxpayer today. Neither will Bermuda, I found out. So, you get this different idea that the ability to move freely with yourself or money around the world is becoming restricted, but more so the advent has been before building a wall between America and Mexico, all that drama that's taken place is actually really showing up in the movement of capital. It's much more difficult, and there are things I learned. They're big believers in gold. They believe that this mismanagement of fiscal monetary policy, the French government, the socialist there was proposing a 100% income tax, basically taking people back to feudalism. Bizarre that he would think that, and I think what happens is that when you don't get mainstream thinking, that is we want to have the streamline regulations, have taxes that are appropriate and accountable for what we're spending the money for, whenever you get this excessive right wing or excessive left wing, you create volatility for investors. That's something that's coming out of France. France is the second most important part of the Europe, when England's gone. The other thing you need to realize is that England was the second biggest contributor to the EU budget, and that was offending a lot of the British taxpayers that not only were all these immigrants coming in because of the bad government policies of other countries, they were sending their tax followers out to build better places for France and Spain, and other countries. So, I think that the world is resetting. I think that's positive, to get a rebalance there, and I think that we're going to continue to live with low interest rates and suffer with these regulations until we get finally a breakthrough. And once we get a breakthrough, because whenever you get fiscal policy incentives, streamline regulations, create tax incentives, you get a much bigger bang for your dollar and growth in the economy. That's why when China started its revolution with Deng Xiaoping in 1978, they created seven tax free zones. You see that in San Antonio to get Toyota to build a car plant here a decade ago, it was to provide all these tax and training concessions, and it's been a big windfall to us. So, it is so key and right now Washington’s in a stalemate of streamlining regulations. Mike Gleason: Do you expect the bullishness for gold that you were seeing there in Europe to make its way here to the U.S.? I mean, since gold is really the anti-dollar, it seems that we need U.S. hedge funds and some hot money to come into the market in the Western world to really take it to the next level. Do you see that happening here, Frank? And what could possibly trigger the renewed appetite for precious metals among U.S. investors? Because retail demand is quite soft and it seems like most of the rest of the world are really the ones that are focusing on gold right now. Frank Holmes: I think it's not so much this conspiracy theory on gold and money and the dollar. I think it's better to look at the imbalances that take place in an economy's fiscal and monetary strategies. And whenever you get these imbalances, gold will perform exceptionally well during that process. It's in America and it's in many other countries in the world, of this monetary driving the equation, and not fiscal policy that's driving the equation, except for more taxation and regulation. I just think that the U.S. still has this imbalance. Europe clearly has a much greater imbalance, and difficulty in this monetary/fiscal policy imbalance. And I think we're going to mutter along with it. You saw India has a surtax on gold imports and finally after all the currency debauchery that took place where they wiped out 86% of paper money. 86% of Indian money, paper money, was in 10's and $5 bills. 86%. They said, "If you can't show where you got that money from, then you lose 30% of the dollar value. You better run to the bank and show where that cash came from, to stop the corruption as they're going through an election cycle. Well, that's all done and immediately you saw a surge in gold prices. The demand that India's getting back to, it was up 300% from a year ago. I think there's other positive parts to take a look at that gold demand, the supply from around the world is just not growing the way paper money is growing. It'll just be these continuous imbalances and you should have your exposure to gold and it should be 5-10%, and the magic is to rebalance. So, when we get these incredible runs, you have to take some profits off the table because we will get these big corrections, in particular in the (gold) stock prices. I think the real shocker here in this first quarter is last year in the first quarter when gold jumped 6%, you had a massive move from 40-80% in gold stocks. This year, it's a very modest increase of like 14% I think for the first quarter, and gold is up six and a half percent. The big part of that is this GDXJ rebalancing and it's garnered, it's almost 10% of all gold equity funds. Money's not really going into the gold equity funds. They're going into the gold ETF which has nothing, no thought process on taking stocks for values. It's just market cap. Now, they're making a decision that they don't want to have as much small cap because they could own too much of a company and they've been dumping, and it's going to happen now over the next month, something like three billion dollars’ worth of the junior gold producers. These are disruptive in the capital markets. They make people skeptical, et cetera, but you know what? They provide an opportunity. If you can understand an index as doing this and all the regulations around that index and that's what they say as the reason they have to do this, then it becomes your opportunity. Mike Gleason: Obviously geopolitics are starting to flare up here as tensions between us, Syria, Russia, North Korea, and China are making headlines. Where does this all head and what investment class do you see being the primary beneficiary of all this global tension? Because it does feel like we're in maybe the calm before the storm here, especially when you throw in everything that's going to happen in Europe, with those key votes in the EU later this year. What are your thoughts there, Frank? Frank Holmes: I think that dividend stocks and stocks that have the capacity to raise dividends are going to still do well. I really do. I think that gold is going to be… that there are so many great quality gold stocks, and I think that they're going to do well. I think that MLPs are involved in the shipping of energy, not the processing of energy, they're going to still do extremely well. I'm constructively bullish, it's just I think we're going to have more volatility. And volatility should be to your benefit. You should understand what that DNA of volatility, and let me help you with your listeners. When you do a rolling 12 month period for the past decade, it is a nonevent, that is 70% of the time gold can go plus or minus 20%. That's the same thing with the S&P. They're both the same. They both have the same DNA of volatility. But gold stocks have a DNA of volatility which is two times that, that is 70% of the time, it's a nonevent for them to go plus or minus 40%, and so is biotechnology, and so are other sectors of the economy that have a greater volatility to them. So, the magic is to understand that DNA of volatility, and every time you get a big sell off on the gold stocks, you want to be a buyer because the math is in your favor to rebound back to the mean. The same thing is with other asset classes, like technology, especially biotechnology, which has the same DNA volatility as gold stocks. Emerging markets have the same volatility of gold stocks, and that's another classic for your listeners. If you read New York Times, it always has negative news on emerging markets and Trump is bad because emerging markets, et cetera. Did you know that the Chindia ETF, which is basically China and India equally weighted ADRs, big cap stocks in that particular ETF, which represents 40% of the world's population, was up two times what the S&P was last year? In the first quarter of 2017, its return was twice the S&P 500. So, emerging markets are actually doing well. When I look at our emerging European fund, the dividend yields on there are averaging like 4%. When I look at our global resource fund, the dividend yields there are like 3%. I mean, I'm buying a real resource, I'm getting a dividend that's growing, it's growing at 3%. There's still lots of M&A activity in the chemical industry, so there's lots of places I'm actually constructively bullish on. If you believe of this other part, the whole theme on military spending, it's 600 billion dollars. They've sold off here recently, but I think stocks like Boeing which is in our JETS ETF, is not only making all the airlines that you're flying, but they also make a lot of components that's for the military. That stock has been on a beautiful climb. When you look at the budget that’s going to go towards military spending, and technology towards the element of technology in defense spending, those stocks I think are going to do exceptionally well over the next five years. Mike Gleason: Well gold and silver are off to a good start in 2017. We've talked earlier about negative real rates supporting prices, and some other potential market movers that could drive demand for the yellow metals specifically. As we begin to close here, what else if anything are you focusing on in terms of potential catalysts that may drive things for the rest of the year? And do you think there's still some more upside in the metals? Frank Holmes: Yeah. I think you're going to see… I have to forecast what I thought the price of gold could do, and I said it can run to $1,500 this year. You have that probability on a rolling 12 month period. When I look at my quant models and I look at the fundamental factors around the world, it could easily do that. I'd also like to point out to all your listeners that every president in the '90s, and we've seen in the past decade, starts off with a campaign that “China's a currency manipulator,” until they get into power and they realize they're really not manipulating the currency. The New York Times is anti-China, they're anti gold and they're anti the Clintons, so it seems to be this pervasive, don't get confused with all those headline news, and recognize that China, there's a lot more in common with China's leader with Trump than you would normally think, and the same thing is with the leader of India, Modi. These are three mavericks that the media liked to attack. They do things their own way, they go after corruption, they want to renegotiate deals, they all believe big in their own country. They're very country centric. They want to trade with the rest of the world, but their priority is to be focused on their own domestic economy first. So, I think this is a really positive dynamic and I'm going to bet like Buffett, I'm being positive. Mike Gleason: Well thanks for the fantastic insights as usual, Frank. It's always great to hear your thoughts and we really appreciate your time once again. Now before we let you go, please tell our listeners a little bit more about your firm and your services and then also about your fantastic Frank Talk blog. Frank Holmes: Well, thank you. Very kind, gentle worlds. I love it, and we do work very hard. We've done 88 awards in a competitive arena in the fund business on education. We have 40,000 readers in 180 countries, and I welcome to go to USFunds.com, and sign up for Frank Talk. I talk about my travels around the world, as we started off this conversation, and try to relate to investors my tacit knowledge along with my quant explicit models, to try to navigate through the world. So, please go to USFunds.com, we have the top performing gold funds, we have also, I love the short term tax refund called NEARX. It's stable, $2 approximate price, and it's much better than a money fund because of its higher coupon. Much higher. We have many different types of funds from China to Eastern Europe and domestic funds. Mike Gleason: Well excellent stuff. Thanks again, Frank. Congratulations on picking up some more awards. Very well deserved, keep up the good work, and we'll look forward to speaking with you again in the coming months. Take care. Frank Holmes: Thank you once again, my friend. Cheers. Mike Gleason: Well that will do it for this week. Thanks again to Frank Holmes, CEO of US Global Investors. The site is USFunds.com, and be sure to check that out, and also the previously mentioned Frank Talk blog, some of the best market commentary you will find anywhere on gold, the miners, the commodities as a whole, and many other topics related to the investment world. Again, you'll find all that at USFunds.com.